Although this story features a celebrity, it is really about a different kind of Superstar. In order to fully appreciate the tale, you need to know some background. Our Superstar, Kevin Maskey, may possibly be the most giving, selfless person on the planet. As an employee, father, son, husband, and human being, he constantly is doing something for someone else, and rarely for himself. For the purpose of our story, let’s focus on Kevin the employee. Kevin is the service manager at Gerald Jones Honda. He has 60 employees who report to him, and with the volume of business that cycles through his shop, you can imagine the number of customers who need his help every day. There is rarely a time when Kevin doesn’t have a line of people waiting to talk to him. His days at work are hectic and long, yet he doesn’t let the stress make him grumpy, as we often see in people under that much pressure. He is one of those rare managers who can push hard for his business, do the right thing for the customer, earn the respect of his employees and still find some humor in every day. Kevin ran the service department at Saturn from the time the dealership opened until the day the sign came down. He has also managed the local Acura, Chevrolet and Mazda service departments. I would always watch in amazement as he worked his tail off, building each business to run smoothly with happy customers and profitable numbers. No matter how chaotic a department would be when he arrived at a new store, he had it turned around by the time he left. Every boss he worked for was sad to see him leave, knowing how difficult it would be to find someone that talented to run their service department. But the car business is a brutal world. You are only as good as your last best month, and it’s all about the numbers. It is rare for someone doing a good job to hear the words “Thank You.” Despite the level of dedication that Kevin has shown to his employers through the years, moments of praise or appreciation have been rare. This leads us up to our celebrity story. Kevin was taking me to see Rick Springfield for my 46th birthday. A loyal Rick fan, I was excited to go to my 5th concert during a span of 28 years. Despite the many shows, I had never managed to finagle an autograph, and Kevin was determined to get one for me. Camera and Sharpie in hand, Kevin was focused on finding a way to capture a picture or a Rick signature. It was his mission for the night. We went to the show with my sister and brother-in-law, and had a couple of extra tickets, which Kevin shared with his boss Andy Jones. When Andy and his wife Connie arrived, they set up chairs near us in the VIP area, where we all relaxed to wait for the show to start. During the pre-show activities, the event organizers decide to have Columbia County Chairman Ron Cross hold a live auction of a guitar to be signed by Rick. The money would go to the local children’s hospital. Andy jumped up and got into the bidding. The figure started at $1,000, and soon the asking price skyrocketed as several concert-goers competed for the chance to meet Rick and get the coveted guitar signed after the show. By the time Andy won the auction, the stakes were high, and the children’s hospital was going to receive his generous gift of $4,700. The crowd was wound up with excitement. As long as I live, this is a moment I will never forget. Andy went back to his seat and I looked over at Kevin. I could read the emotion on his face, and see the red eyes trying so hard not to lose it. There is nothing more powerful than the image of a strong man on the brink of tears. He was touched that someone would make such a grand gesture on his behalf; I was touched by his reaction. After so many years of long hours, stress and sacrifice, suddenly someone demonstrates sincere appreciation of his effort in a meaningful way. All Kevin wanted was to help me to have a special memory for my birthday, and here it was. Because of the kind of employee Kevin is, Andy Jones seized the moment with a generous and bold action that translated into a dream come true for me. I wiped at my tears as we sat silently with hands tightly clasped, knowing how much it meant to both of us that someone truly recognized Kevin for the person he is. During the show, Andy told us that when the song “Jesse’s Girl” began, it would be time for all of us to head to the sponsor tent for the guitar signing and picture. After decades of being a Rick fan, I was finally going to meet him. We went to the tent while the encore songs were being performed, and Andy walked over to me with the guitar. He told me, “This is yours to keep, because you are married to a true Superstar.” Andy Jones paid $4,700 so that he could convey to Kevin how valuable he was to his business. Cameras were clicking all around us as I held the guitar with a stunned look on my face. If you see one of those pictures, you may notice my shocked expression as the reality sunk in.Rick came into the tent, where he was immediately ushered over to us. Chairman Cross and Andy introduced me to Rick, telling him that the guitar was for me. Rick shook my hand, signed the guitar, and embraced me for a photo. The moment was a surreal whirlwind, over in a blink. When Rick and the crowd dispersed from the tent, I told Kevin what Andy said-the guitar was ours to keep. We were completely blown away, having difficulty digesting such a magnanimous gift. My sister would later tell me that it was the perfect moment of karma for me, for the kind things I do for others. She is only half-right. It was a moment of karma, yes. But the karma was Kevin’s: for being the kind of person that he is, doing for others every day, all the while keeping his grace and humor, and asking nothing in return. Finally, someone saw how much he was doing for everyone else, and made the grand gesture to match. Thank you, Andy Jones. Although I was happy to finally meet my celebrity, I was even happier to know that my true Superstar got his time in the spotlight. 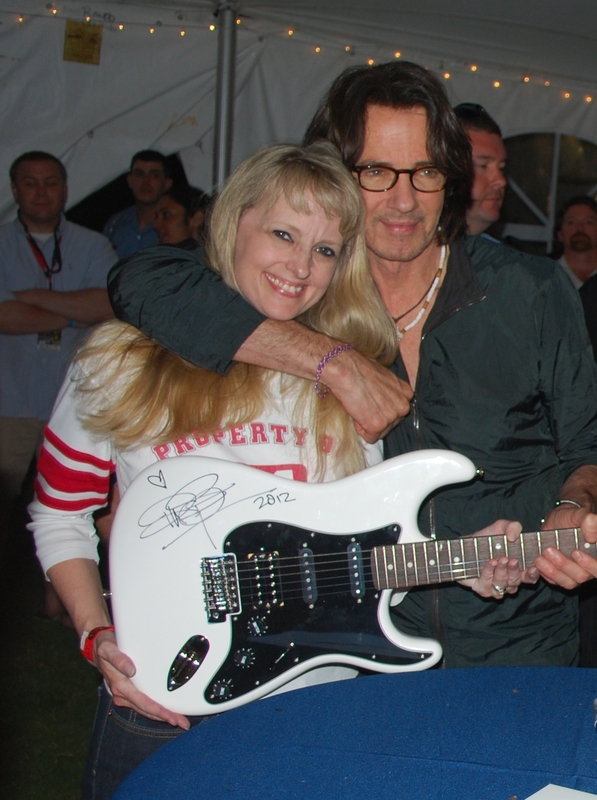 This entry was posted in Celebrities and tagged Rick Springfield on June 9, 2012 by angelamaskey. WOW!!! So eloquently put Angela. Congratulations Kevin!! Congrats on your awesome dirthday present (I too was a real RS fan) as well as your marriage to Kevin! I agree that he is a STAR! So glad to know you both!!!! !